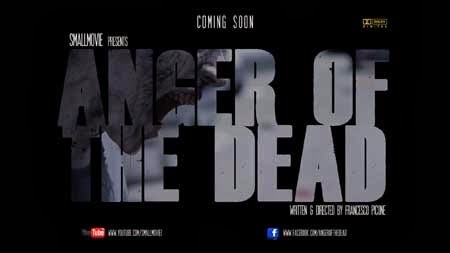 Earlier in the year I wrote a small news post about Anger of the Dead, I have had the pleasure of watching the film now. It is an Italian short zombie film clocking in at around 15 minutes directed by Francesco Picone. Alice and Nicholas are in a cafe where Alice is about to tell her husband some important news. Interrupted by a commotion at a nearby table they see a girl has transformed into a hideous demonic zombie and is chomping down on her boyfriends throat. Cut forward to the future and full on zombie apocalypse has occurred. Alice and Nicholas are on a bridge gathering supplies from the numerous abandoned vehicles left there when zombies attack, their troubles seem to be over when a heavily armed biker appears, but are the zombies the danger they should be most worried about? First off I love the look of the zombies in this film, all the zombies have almost demonic features, their features twisted into a parody of human rage, they certainly live up to the title 'Anger of the Dead'. They are runners, but also they are not very clever and so easy to avoid and also are easily distracted by noise. A lot of action occurs here, fast, kinetic shots of zombies charging mixed up with focused gun fire and some brutal close combat, the whole bridge scene is quite enjoyable. The biggest complaint I have to say of this film is that it is a shame the English subtitles are not very well translated, usually you can guess what they should say but at one point when there is quite a big story reveal I couldn't actually work out what it was as it got very lost in translation. The characters in the piece obviously don't get much time to develop but the actors seem to do a good job, the biker (Alex Lucchesi) was the most interesting character, he really stood out as a force to be reckoned with. Special mention must also go to the fantastic music by Riccardo Lacono, reminded me of 1980's zombie flicks which is a very good thing! It looks great, has some cool zombie action and was fun to watch, is just a shame the subtitles were below average. The plot is quite traditional (humans are always the real monsters) but it did the job.